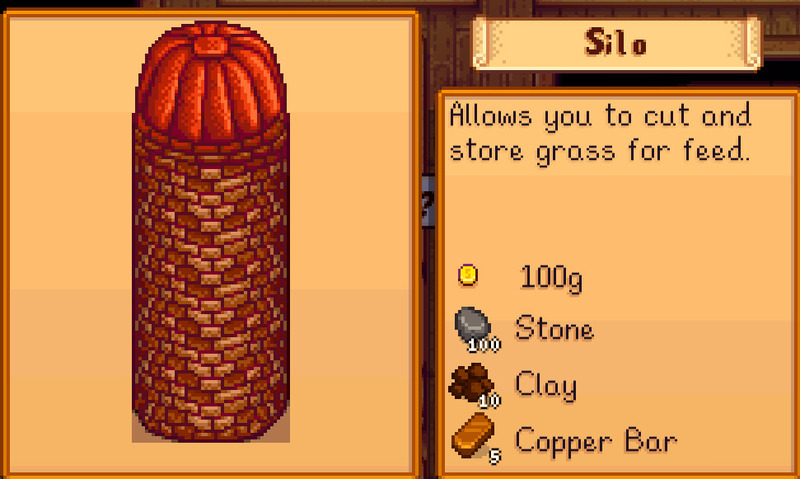 Silo allows you to cut and store the grass for feed. It can hold up to 240 hay pieces. Its area is 3 x 3. -You will need 100 gold. -You will need 100 stone. -You will need 10 clay. Lastly, you will need 5 copper bars. A well provides you with a place to refill your watering can. Its area is 3 x 3. -You will need 1000 gold. -You will need 75 stone. The mill will allow you to create sugar from the beets and flour from wheat. Its area is 2 x 4. -You will need 2500 gold. -You will need 150 wood. -You will need 150 stone. -Finally, you will need 4 cloth. 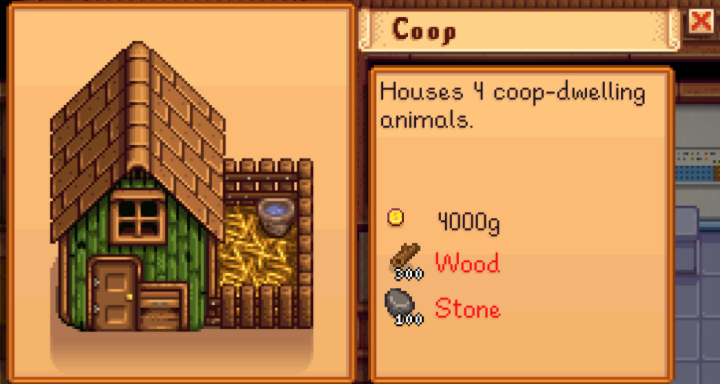 A coop can hold up to 4 animals that live in coops. It also unlocks chickens and has an area of 3 x 6. -You will need 4000 gold. -You will need 300 wood. A big coop can house 8 animals that live in a coop. It unlocks dinosaurs and ducks and comes with an incubator. It has an area of 3 x 6. -You will need 10,000 gold. -You will need 400 wood. A deluxe coop can hold up to 12 animals that live in a coop. It unlocks a rabbit and comes with the auto feed system. It has an area of 3 x 6. -You will need 20,000 gold. -You will need 500 wood. -You will need 200 stone. A barn can house 4 animals that live inside a barn. It unlocks cows and has an area of 4 x 7. -You will need 6000 gold. -You will need 350 wood. A big barn can hold up to 8 animals that live inside a barn. 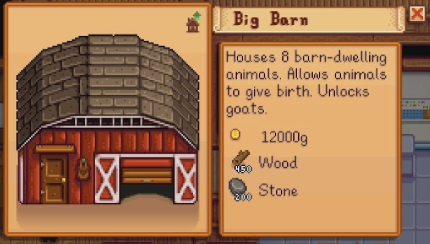 It unlocks goats and allows the animals to give birth. The area of the big barn is 4 x 7. -You will need 12,000 gold. -You will need 450 wood. A deluxe barn can house 12 animals that live in a barn. It unlocks pigs and sheep and comes with the auto feed system. It has an area of 4 x 7. -You will need 25,000 gold. -You will need 550 wood. -You will need 300 stone. 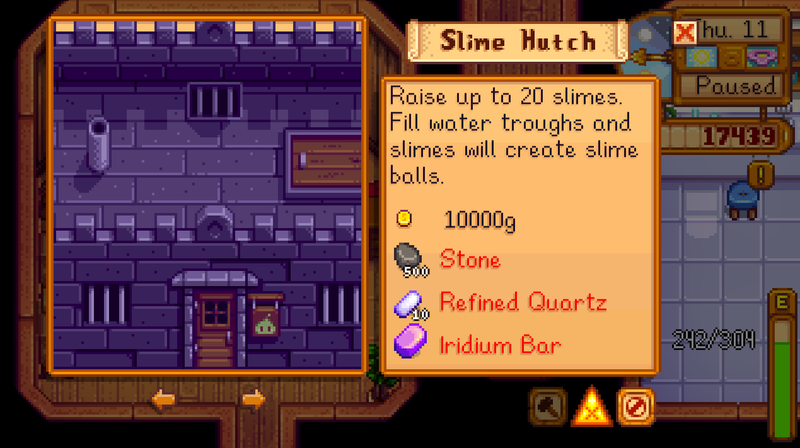 A slime hutch can raise 20 slimes. Fill the water troughs, and the slimes will create slimeballs. It has an area of 6 x 11. -You will need 500 stone. -You will need 10 refined Quartz. -You will need 1 iridium bar. 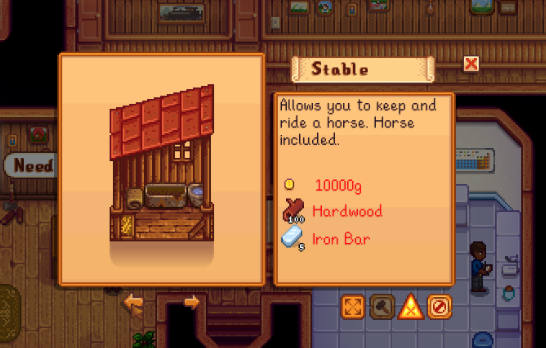 A stable allows you to keep a horse and also ride it. It comes with a horse and has an area of 2 x 4. -You will need 100 hardwood. -You will need 5 iron bars. It is an empty building you can fill it with anything. You can also decorate the interior of a shed. It has an area of 3 x 7. -You will need 15,000 gold. With house upgrade 1 you will have an increased size with a kitchen. This upgrade will add two rooms where one room will have a crib with two single beds while another one will be empty. The kitchen also gets larger. -You will need 50,000 gold. -You will need 150 hardwood. It adds a cellar that can be accessed through the kitchen. You will just need 100,000 gold.